Thank you so much Fran! I think Next Generation Read Aloud is needed for the sake of teachers too since it will change our perspective of the role we play and enhance both assessment and instruction. I think this sharper lens for who’s doing the work is much needed! So much wisdom here, and behind it all are amazing teachers changing the face of education, one read aloud session at a time. I love that Margaret – “changing the face of education, one read aloud session at a time.” As long as we keep read aloud alive in classrooms across the country and in our discussions, I know that will happen! 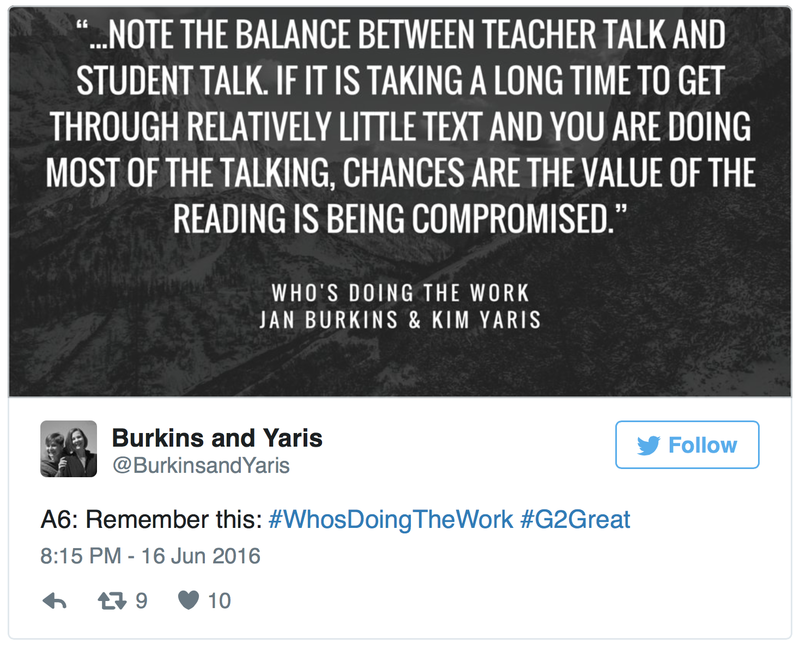 I love this synthesis of the #g2great chat. At times, I have felt like a thief in the night as far as read-aloud is concerned. The chapter of the book on read-aloud has provided me with reasons that I can use to articulate the power and necessity of read-aloud. 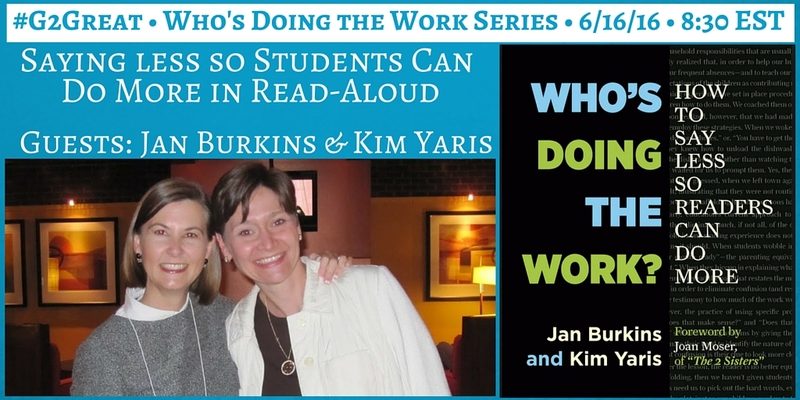 Read-aloud is a thinking experience and there is no reading without thinking. I love your description of read-aloud as a THINKING EXPERIENCE Lisa. As long as we can continue to be vocal in both our discussions and practices and demonstrate what it looks like as a thoughtful and pleasurable thinking practice, I suspect those days of feeling like a thief in the read-aloud night would be in our past. 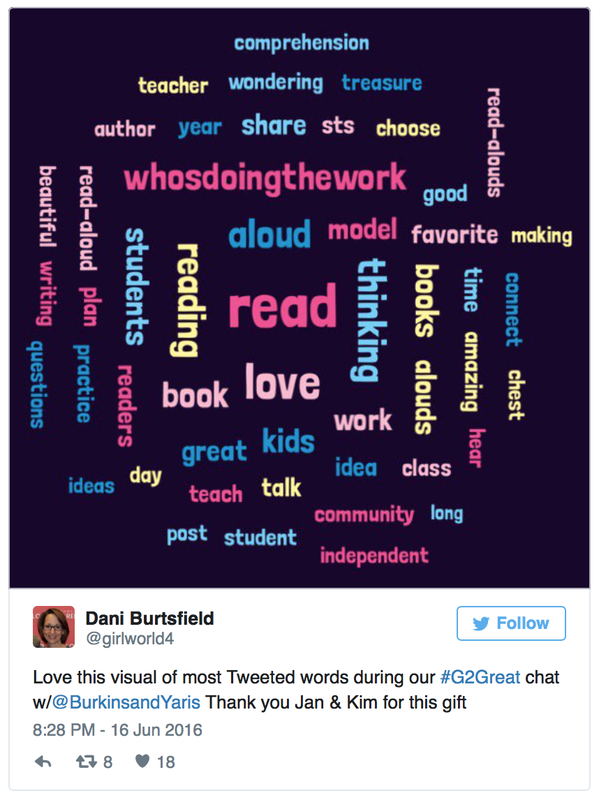 Thank you for sharing your synopsis and reflections on what sounds like was a powerful Twitter chat. Lots to take away and ponder here! Reflective pondering is our best tool for holding tight to powerful practices Erin. I’m so glad this gave you some read-aloud food for thought!